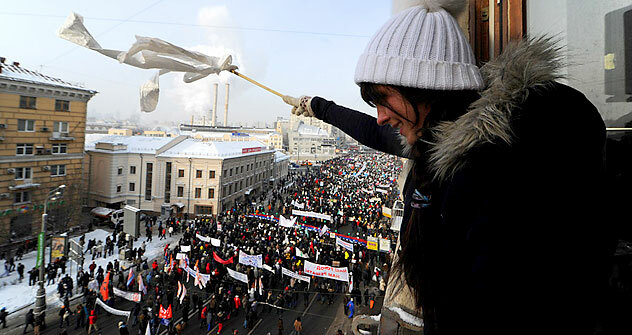 In the midst of Russia’s 2012 presidential campaign, protests on Feb. 4 showed that Russians remain ready to take to the streets in defense of their rights – or their preferred candidate. The Feb. 4 mass demonstrations in Moscow were the largest since the first spontaneous protests erupted after the State Duma elections on Dec. 4, 2011. People from across the political spectrum took to the streets in spite of the severe cold. Four separate rallies took place in Moscow on Feb. 4. According to official data, the combined total of rally participants equaled more than 175,000 people. The largest demonstrations took place on Bolotnaya Square and Poklonnaya Hill while a small rallies were held at Academic Sakharov Avenue and Pushkin Square. Mass rallies were held all over the country, including in Vladivostok, Irkutsk, Yakutsk, Novosibirsk and other Russian cities. President Medvedev even suggested that a separate protest site should be established in Moscow. The data based on the information from the Russian media outlets and official figures. Click to enlarge. At Bolotnaya Square, the temperature was -22 °C (-7 F). A small group of people handed out white scarfs rather than the white ribbons that are known as the symbol of support for the protest against election fraud. Many protesters tried to warm themselves by moving and stamping their feet. Others wandered over to a truck covered with symbols of billionaire and presidential candidate Mikhail Prokhorov, who stood in the middle of the crowd. "After surviving the 1990s, Russian society was not ready to face yet another shock. There has never been democracy in this country – a strong leader was in power under every regime. However, the opposition cannot provide such a leader now. What is happening now only proves that the current state of mind of the Russian people is poor, they march and protest but still don’t comprehend what the future has in store." The Russian opposition figures who organized this protest anticipated that few people would want to stand for very long in the cold, so it focused its efforts on a 40-minute meeting. The number of protesters gathered on Bolotnaya Square made it impossible to elbow your way through to the stage. Large TV screens were set up so that everyone could see what was taking place on the stage. Each speaker spoke for around two minutes, and every speech ended with the chant : "Putin, Leave!" The Dec. 4 State Duma Election, which resulted in victory for the United Russia party, were the catalyst for mass rallies in cities across Russia protesting election fraud. The authorities assured the protesters that all reports of fraud would be thoroughly investigated, but the Central Election Commission later claimed only 11.5 percent of complaints (195 out of 1,686) turned out to be valid. "Like anybody else who came to Bolotnaya [Square], I felt that the truth was born there," Yury Shevchuk, a prominent Russian rock musician, said in an interview to Kommersant Daily. According to popular writer Boris Akunin, "People who came here are calling for fair elections. Once democracy is established in this country, democratic institutions and fair elections will help us to choose the right political force." In response to the opposition protests planned for Bolotnaya Square, pro-Kremlin activists, journalists and politicians organized another meeting on Poklonnaya Hill in support of presidential candidate and Prime Minister Vladimir Putin. The portrait of a protester: To go or not to go? The Poklonnaya Hill meeting began with chanted slogans, including: “We have something to lose” and “fight the “orange movement,” a reference to the 2004 protests in Ukraine. At this rally, pro-Kremlin activists accused the opposition of “undermining the idea of democracy.” Putin supported this demonstration, and described its participants as true opponents of the opposition movement. The comments which fueled an online confrontation between the two camps. In a single hour, the debate was mentioned more than 20,000 times on Twitter. Journalist Mikhail Leontiev, one of the organizers of this meeting, said in an interview with Russian business daily Kommersant that he supported the government and was doing his best to prevent a second perestroika. He described the participants of opposition movement as "an ambitious and short-sighted minority" that didn't understand the consequences of a political crackdown which, according to him, could result in another civil war. On Feb. 4, 1990, a mass protest was held in Moscow calling for the annulment of Clause 6 of the Soviet Constitution, which proclaimed the Communist party "the driving force” of Soviet society. The next day Mikhail Gorbachev issued a statement asking for the annulment of Clause 6 an the establishment of the post of president. Among those who raised his voice against Clause 6 was Andrei Sakharov, the namesake of Academic Sakharov Avenue, where the Dec. 24 protest for fair elections took place. There is speculation that the organizers of the rally on Poklonnaya Hill will be fined, because they applied for a permit for a meeting of 15,000 people, but more than 130,000 showed up, according to the Moscow police. Meanwhile, the protest organized on Academic Sakharov Avenue had the opposite problem. Organizers and opposition activists Valerya Novodvorskaya and Konstantin Borovoy expected 30,000 people, but only 1,000 turned out. Another approximately 1,000 people came to Pushkin Square to attend a rally sponsored by the Liberal-Democratic Party of Russia. Vladimir Zhirinovsky, the head of the party, used the rally to encourage participants to vote for him in the March 4 election. The organizers have scheduled the next protest for Feb. 26, exactly a week before the March 4 presidential election. Source: The data based on the combined information from the Russian media outlets and official figures. Click to enlarge.